This post is meant to be a review of the club whisky for the third meeting of the D.T.W.C, a Glenfarclas 25yo. I can honestly say this is the hardest post I’ve ever tried to write, a review of a whisky that I cannot taste and have to complete from memory. Not only that, but the two occasions on which I have tasted the whisky (Whisky Live & D.T.W.C. meeting 3), occurred whilst I have to admit, I was not in peak condition, due to the copious consumption of numerous drams. This leaves me in a rather precarious position I’m sure you’ll agree. 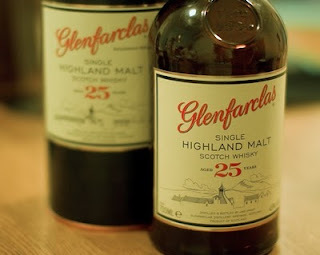 What I can tell you is that the Glenfarclas 25yo is a great whisky. It is very smooth with a complex flavour. Everybody who attended on the night enjoyed it, and the whole bottle was consumed within the first couple of hours. That speaks volumes about member satisfaction. Both previous whiskies purchased by the club had left overs after the night (or would have if El Capitan didn't make one whisky a personal challenge)! Nose: Complex, yet refined, delicately peated, with fresh tempting aromas of marmalade, honey, freshly ground coffee, sherry and nuts. Some oaky tannins’. Flavour: Full-bodied and robust, the sherry and the oak fight for your attention yet neither is overpowering. A powerful nutty smokiness. Finish: Intense, long lasting, dry smoky and malty. A beautiful dark Belgium chocolate taste at the back of your mouth to complete the flavour of the 25 Years Old. Comment: A great after-dinner whisky so rich and full that it is a dessert in itself, with a finish that goes on forever. Now to be honest, I recall discussing that description on the evening, and my recollection of the member consensus was that this was not a good description of the whisky. As I said in my last post, there was some obvious smoke, some citrus and that’s about it. I encourage members to add their comments below. Given my somewhat hazy recall, I do not think it fair, and do not propose to give the Glenfarclas 25yo a lighting bolt rating, although if pressed, I would rate it highly.